Most piano players appreciate the Casio Privia PX150 as a masterpiece. They assume that the manufacturer will be difficult to get the achievement again. The more the features, the more expensive the price will be. That’s wrong! Casio claims that the price level is not differential though they have added the useful characteristics to the Casio PX160. Include the MIDI recording, enhanced speakers, weighted keys, and other features. Have built-up as a portable instrument. The Casio PX 160 is easy to move and fit the narrow areas, apartments, dormitories included. The model is frequently recommended for the novice pianists. It is noticed that there are the educational purposes of kids. Continue reading my ​Casio PX 160 reviews to know more! Go! Go!!! Is the Casio PX 160 Good For Your Investment? The first question is posed: What will you get if used Casio PX 160? Look at here, the specs and features that I list below will be the best answer for you. Foremost, we will learn on the design, keyboard, and accessories – the exterior features of the PX 160. The PX 160 – a compact digital piano has 88 keys. With the 25.5lb weight and the 52-inch width, it is very standard. Being the pretty-slim design, the depth of the PX 160 is under 12 inches. It almost fits a narrow space; even, you can still put it on a table. For the portability, to perform, practice, move, everything is okay. In spite of not consisting of the stand, there still have other additional attachments. I will specifically share in accessories. How about the construction? Yes, it is great whether the main material built-in is plastic. Instead of feeling cheap or poor-quality, when touch, you will feel nicer. But, you need to pay attention to its plastic case. When moving frequently, it would be best to consider equipping a piano bag to protect your piano from damage. Have all 3 colors – gold, black, and white. In spite of not flashy, they bring the contemporary, fresh look. What a precise it is! For the settings, including, the sounds, recording, volume control, or metronome, have the dedicated buttons. In addition to that, there is an intuitive control panel. Unlike the modern models, the PX 160 does not have a display. To find out the key combinations, it forces you to utilize the manual until you have completely memorized them. In this price range, we cannot require too many. The fully-weighted keyboard of the PX 160 has 88 keys. All they have the similar size to the general keys. Through the Tri-Sensor Scaled Hammer Action II, it makes sure that the key response is realistic. The range (from pianissimo to fortissimo) is very dynamic. Not being a semi-weighted keyboard, these fully-weighted keyboards do not need to utilize springs to increase the key weight. Instead, have the actual hammers that bring the same realistic feel as an acoustic piano. The plastic keys will be easy to slip when using for a long time. But, this does not occur with the PX 160. To increase the grip, they simulate the Ebony and Ivory experience. If the sound volume is affected by the hammers when striking the strings, the velocity when pressing the keys is under the effect of the triple-sensor system. Via this system, both the timbre and volume is properly changed. When playing the harder keys, the sound will be louder. For settings, there are 3 preset levels to adjust. You can also turn it off entirely. Once the turned-off sensitivity, the volume of the piano does not still change whatever you press the hard or soft keys. It is noticed the graded keyboard – the high-register keys. The manufacturer has simulated the feature of the acoustic pianos. They are both light and easy to press compared to the low-register keys. As previously stated, the stand is not packed with the PX 160 when purchasing. Probably, the compact design is convenient enough to place on most surfaces. But, it is not necessary. A stand is still more dedicated. Have the dedicated stand for the PX 160 – the CS-67P and the types from Privia line. If you do not have to move the piano much, they might be a sufficient-good selection. In case you need the mobility, I recommend choosing the X-type stands. You are easy to adjust and fold up. Like that, when you are not playing, you may quickly take it out of the stand. There is the Casio SP-3 sustain pedal, along with the piano, but personally, I do not highly appreciate this pedal. To have something that looks more practical, a good suggestion for you is the M-Audio SP-2. It has a more durable construction. Unless the Pro Bundle or SP33 triple pedal is a not-bad idea. As indicated above, the PX 160 has the compact, light design, so you can carry it anywhere to perform or practice. Nevertheless, the plastic housing will likely get damaged if there are too many transportations. A padded piano bag will be ideal! Say to the protective cases or gig bags, we always have more than one choice. For the PX 160, the Casio provides the Privia case – both the durability and the affordable price. Remember to test if it fits before purchasing. To practice in individual, the headphones are handy. You just play without disturbing anyone. It is noticeable that the high-grade piano headphones are going to offer a clear sound than the onboard speakers. To be able to own the best piano, the first problem is the size and accessories. Based on that, you can determine the suitability level. In keep with a small living space, the Casio PX 160 has an enough-compact design. Although it seems heavier than the PX 150, it only needs one person to set up. And don’t also require the complicated tools to set up. In fact, you do not have to do all yourself. The main parts are pre-assembled. Your task is to connect the holder of the music sheet and then plug in the cord. Attach the piano to its stand if had. All are quickly done because of weighing just 25.5 lbs. Once you have set the correct position of your piano, there are children, who are also easy to install quickly. Continuously, have to say to the reason why the piano players prioritize to select the PX 160 – the minimalistic design. Whether you are roughly handling, there will not also cause to damage to your piano. Combine with the sturdy exterior. This is both a strong point and vice versa because it will limit the movement. To improve this one, you can pay a reasonable budget to get the optimal transportation. The majority of the today pianos easily connect to a MIDI device, laptop, or computer through a USB. And so do the Casio PX 160. Thanks to that, you can record the music, but there will have a certain limit. With a 2-track recorder, it enables you to record melodies from a couple of the accompaniment. In its own way, the PX 160 has the line-out connections. This is a significant improvement in comparison with the previous version – the PX 150. On the back of the Casio PX 160, have the left-and-right channel connection. Using this connection, you might connect it to the external speakers. Don’t stop! The model is also available for another connection – the headphone. Include the sockets on the front so that you can plug in your headphones. This design makes you access anytime if desired. It cannot deny that the additional sounds are wonderful. But, with a digital piano, the piano sound is integral. 5 grand-piano sounds on the PX 160 are imitated like the real grand piano. The timbre of every tone is not the same. This allows you to select the most suitable one for yourself. The most natural? In my opinion, there is the concert grand sound although all five are pretty natural and very close. On the other hands, the PX 160 from Casio uses the Multi-Dimensional Morphing AiR Sound Source that the before version seems to miss this feature. So, what is it optimum? The first is the memory capacity. Increase the sampled sounds up to three times. Consequently, whatever there are the sounds with the small nuances, you still hear owing to the top-grade samples. The outstanding point of the Morphing AiR Sound Source is the ability to compress the lossless audio and reproduce the non-distorted sounds, which the formats such as MP3 or AAC, cannot do. Reverb effect: Help to resonate the notes that you are playing. At once, from the different places, it will recreate the acoustic environment. You likely choose one of four following variations: Large Hall, Room, Stadium, and Small Hall. Chorus effect: The sounds will become richer and louder, relying on this effect. Bring the feel like the sounds playing at the same time. Deep, Light, Flanger, and Medium are the choruses for you select. Desiring to be softer will become softer. To get the harder sounds, it is okay. You can completely adjust the sound brilliance. Polyphony – Consist of 128 notes. Make sure that do not have any notes being cut off. All notes playing will be heard. Due to recording two tracks only, the polyphony with 128 notes is sufficient; even, in case you play with two records. Speaker – Most users complain about the poor quality of speakers of the PX 150. They must use the headphones to replace if desired to get the better sound. Have peace of mind! This will not repeat with the PX 160. With the built-in speakers, help to improve considerably the sound quality of the Casio PX 160. Based on the nice resonance, you hear more clearly. In addition, don’t need an amplifier to enhance the sound because the speakers offer the sufficient-loud. Unless you have the bigger performances, an external amplifier will be essential. After all, I recommend choosing the high-class headphones if you use them for the purposes – get the best sound and no disturb others. When selecting the bass sound, the keyboard will be split into two sections. Assigning to the left part is the bass sound. And the remaining part, depending on your demand, you might assign any sound. Have up to 18 various instrument sounds to play. Via the layer mode, you likely let two different sounds layer simultaneously. For instance, to try the combinations you’d like to, you can entirely utilize your creativity. If you want to play with someone, instead, alone, there still have the Duo Mode. In this way, one person on each side can play the similar notes. Personally, I recognize that this duet mode is helpful for training. A teacher will sit beside his/ her trainee to guide and follow, for example. Have all 60 built-in songs that the PX160 offers. Play a specific song or play all in an order. No problem, when playing each song back or even playing with the songs. Just need not to be fixed the playback tempo and remember to play both the left and right sections in a separate manner. You do not meet any difficulty to increase or decrease the pitch of the total keyboard. Apply the transpose function, it allows you to play a song in a various key. Interestingly, this function is useful for playing a song only in a key. This is the perfect function to change the keyboard pitch in the octave units. You will not likely fine tune the pitch if your piano is short of this function. The fine-tuning function of the PX160 helps to lower and raise the keyboard pitch within 0.1-Hz steps. Moreover, provide up to 16 various temperaments in order that you are easy to change its initial equal temperament. The warranty is an essential consideration, which any customers should not ignore. Why? Because the warranty contributes to maintaining a product. Have the warranty of the entire products or only some parts. Virtually all the models from the Casio, they have a dependable limited warranty, the Casio PX 160, no exception. The Casio has given a general warranty in one year. After registering, the consumers will have a 2-additional-year warranty. All will be 3 years. Casio’s service policy involves the replacement of the PX160 when its parts are defective. For the price, the Casio PX 160 Privia Series will be no more $500.00 – a reasonable cost. With the accessories: 3-pedal, stand,…, you might buy later. Anything has the advantages and does not lack the disadvantages. It is important that you can accept these weak points, isn’t it? Even the so-called quality, it is really difficult to ensure. So, I make a competition between the Casio PX 160 and two models from Yamaha so as to define the quality of the Casio again. Nowadays, no many competitors can compete with Casio and Yamaha is one of these few. Both promise to provide the great keyboards for most ages. And the closest competitor from Yamaha – the Yamaha P45. I have reviewed this piano in my previous article. It seems that the price is more expensive than the Yamaha P45, so the features are more dominant a bit. The P45 has no a Split Mode as well as an onboard MIDI recorder. What’s more, only with the 64-note polyphony and the built-in sounds under 10, these ones are not enough to compare to the 128-note polyphony and 18 built-in sounds that the PX-160 offers. Being the combination of the P45 with the P225, the Yamaha P115 has up to 192 notes of polyphony, so its sound is natural and realistic. Read my P115 review to get a right appreciation. Come to think of it, the GHS keyboard of the P115 is lighter than the Tri-sensor Hammer keyboard of the PX160. But, do not include the synthetic Ivory and Ebony keytops. All things considered, GHS is less noisy. How are the remaining features? Both are not too different when having a MIDI recorder, the same number of preset songs, the modes, and so on. The Casio PX160 is valuable enough in this price range. Aside from the drawbacks – some can add later, this piano has full of the essential features that you need. How? Do you recognize these? 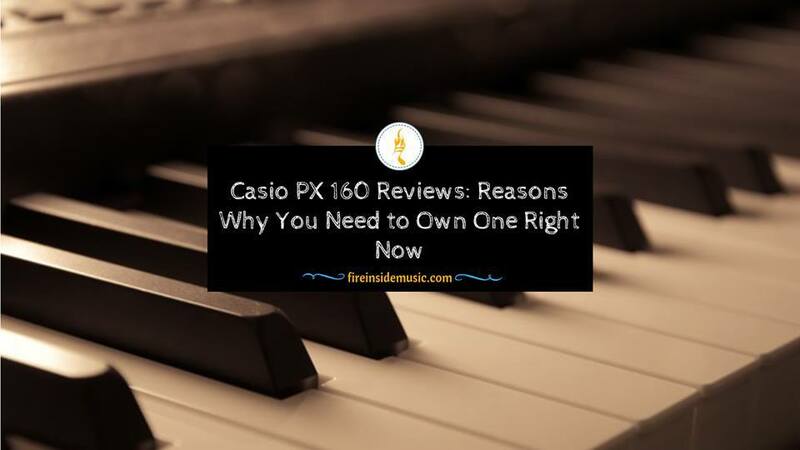 After reading my review on the Casio PX160, I believe that you have found an answer: should I purchase the Casio PX160? From the sound, setup, and accessories, all the information I shared above is sufficient for you. Yet again, you reconsider your demand and look back on what features you are looking for. And then, give your decision. Good luck!! !